Stefan Molgat from Winnipeg, Canada is Dueling against Louis Kelley from Chicago, Illinois in this Round 2 Feature Match! Molgat is using a Crusadia Guardragon Deck made possible by the latest Savage Strike booster set. 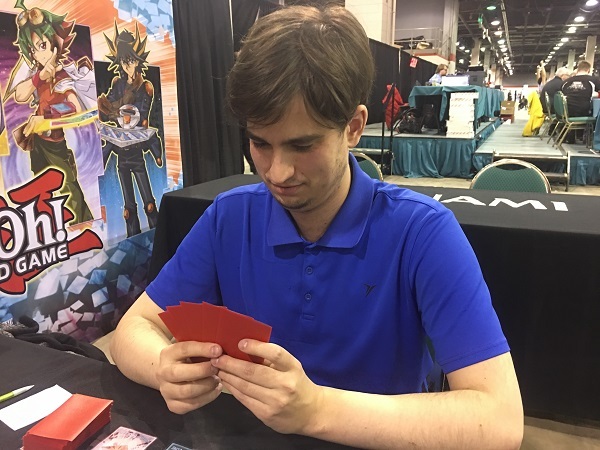 Molgat’s Deck is not heavily represented by Duelists in this weekend’s event, so his ability to take opponents by surprise may work to his advantage this weekend. Kelley, on the other hand, is using a tried-and-true Sky Striker strategy, that many competitors are predicting to be a dominating force this weekend. Molgat is using lots of cards from the latest Savage Strike booster set, including one copy of each of the Extra Deck Guardragon monsters, a copy of Guardragon Cataclysm, and a copy of Borreload Savage Dragon, which he can Summon by Tuning Elephun with World Legacy – “World Crown”. Molgat’s Deck is capable of making a lot of really cool plays and Summoning very powerful monsters, but will the consistency of Kelley’s Sky Striker Deck be too much for Molgat to handle? We’re about to find out. It’s time to Duel! Kelley won the die roll and chose to go second. Molgat opened up with Called by the Grave, Rescue Cat, Crusadia Reclusia, Crusadia Maximus, and Kyoutou Waterfront. He activated Kyoutou Waterfront and then Normal Summoned Crusadia Reclusia. He sent it to the Graveyard to Link Summon Crusadia Magius, adding a Kaiju Counter to Waterfront, and then Special Summoned Maximus from his hand Linked to Magius. He used Magius’s effect to add Crusadia Draco to his hand, and when Kelley tried to stop the search with Ash Blossom & Joyous Spring, Molgat used Called by the Grave and added another Kaiju Counter to Waterfront. Molgat combined his 2 monsters to Link Summon Crusadia Spatha, adding 2 more Kaiju Counters to Waterfront, and then used the effect of Kyoutou Waterfront to add Gameciel, the Sea Turtle Kaiju to his hand. He Special Summoned Draco Linked to Spatha, and used its effect to add Reclusia from his Graveyard to his hand. He then sent Draco to the Graveyard to Link Summon Guardragon Elpy, adding the fifth Kaiju Counter to Kyoutou Waterfront. He used Spatha’s effect to move Elpy over one zone, and then used Elpy’s effect to Special Summon Red-Eyes Darkness Metal Dragon from his Deck in a zone that Elpy and Spatha both pointed to. He then used Red-Eyes’s effect to Special Summon Draco from his Graveyard, and then sent all 4 of his monsters to the Graveyard to Link Summon Saryuja Skull Dread! He activated its effect to draw 4 cards from his Deck and place 3 cards from his hand on the bottom of his Deck. He then used Saryuja’s effect to Special Summon Gameciel to his field, and then used the effect of World Legacy – “World Crown” to Special Summon it to his field Linked to Saryuja. He Set Guardragon Cataclysm to his back row before passing his turn. Kelley activated Terraforming to add Sky Striker Airspace – Area Zero to his hand and then Set a card to his back row. He used the effect of Area Zero to try to destroy the newly Set card, and Molgat removed 2 Counters from Waterfront to negate the activation of Area Zero’s effect and banish it with Gameciel. Kelley activated Sky Striker Mecha Modules – Multirole next, and Molgat flipped Guardragon Catacylsm. He Tributed Skull Dread to destroy Kelley’s face-down Metalfoes Fusion and his Sky Striker Mecha Modules – Multirole, adding 2 more Kaiju Counters to Waterfront. Kelley used Card Destruction next, and after discarding his hand of 2 cards to draw a new hand, he conceded, unhappy with the two new cards he had drawn. Stefan Molgat takes a quick victory in Duel 1 after his explosive first turn! Kelley started off Duel 2 by activating Sky Striker Airspace – Area Zero and Normal Summoning Sky Striker Ace – Raye. He used Area Zero’s effect to target Raye, and then Chained Raye’s effect to Tribute it and Special Summon Sky Striker Ace – Shizuku from his Extra Deck. He added Sky Striker Mobilize – Engage! from the top of his Deck to his hand with Raye’s effect, and Molgat sent Droll & Lock Bird from his hand to his Graveyard to activate its effect. Kelley activated Foolish Burial Goods next, sending Sky Striker Mecha – Shark Cannon from his Deck to his Graveyard. He then used Shizuku as a Link Material to Link Summon Sky Striker Ace – Kagari and used Kagari’s effect to add Shark Cannon from his Graveyard to his hand. He Set 3 cards to his back row and then ended his turn. 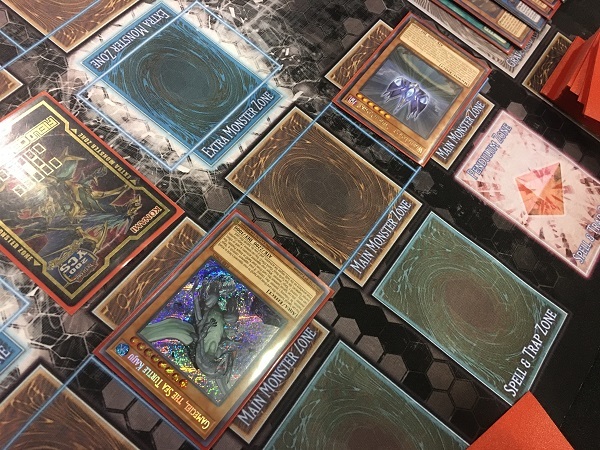 Molgat started his turn with Kyoutou Waterfront, World Legacy – “World Crown”, Crusadia Leonis, and Crusadia Maximus in his hand, and then drew Twin Twisters in his Draw Phase. He activated Waterfront and then activated Twin Twisters. He discarded Maximus to target a face-down Sky Striker Mecha – Eagle Booster and Sky Striker Mecha – Widow Anchor for destruction, and Kelley Chained the Eagle Booster, targeting Kagari. Molgat added 3 Kaiju Counters to Waterfront. He Special Summoned Leonis to the zone Kagari pointed to and then sent Leonis to the Graveyard to Link Summon Crusadia Magius, adding another Kaiju Counter to Waterfront. He then Special Summoned “World Crown” to his field, and added a card to his hand with Magius’s effect. He combined his 2 monsters to Link Summon Crusadia Spatha next, adding a fifth Kaiju Counter to Waterfront, and Special Summoned Draco from his hand. He sent the Draco to the Graveyard to Link Summon Elpy, then moved Elpy over one zone with Spatha’s effect and Special Summoned Red-Eyes Darkness Metal Dragon from his Deck with Elpy’s effect. He used Red-Eyes’s effect to Special Summon Crusadia Draco from his Graveyard. 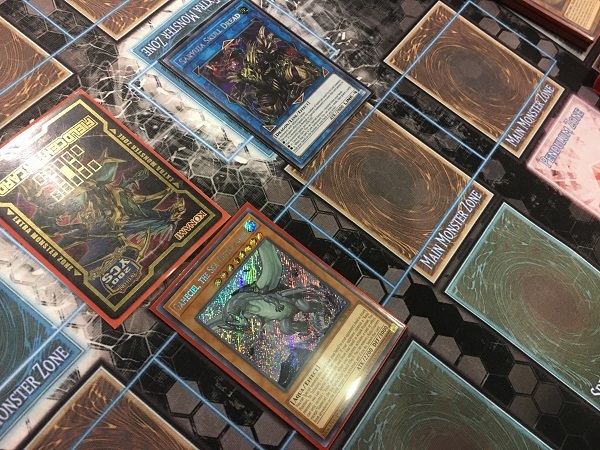 He added Gameciel from his Deck to his hand with Waterfront’s effect and then combined all 4 of his monsters to Link Summon Saryuja Skull Dread. He used Saryuja’s effect to draw 4 cards and return 3 cards from his hand to the bottom of his Deck. He used Saryuja’s effect to Special Summon Gameciel to his field and then attacked Kagari with Gameciel. Kelley tried to use Raye’s effect to Special Summon it from the Graveyard, but Molgat used the effect of Gameciel to negate Raye’s effect and banish it from the Duel by removing 2 Kaiju Counters from his Waterfront. Saryuja attacked and destroyed Maximus, adding another Kaiju Counter to Waterfront. Kelley Set Foolish Burial Goods and activated Area Zero. He used its effect to destroy his face-down Foolish Burial Goods and add Sky Striker Maneuver – Afterburners! to his hand, allowing Molgat to add another Kaiju Counter to Waterfront. Kelley activated Afterburners, which Molgat negated and banished with Gameciel’s effect by removing 2 Kaiju Counters from Waterfront, and when Molgat activated Sky Striker Mobilize – Engage!, Molgat activated Gameciel’s effect again and gave up 2 more Kaiju Counters to negate and banish it! Kelley instantly conceded, completely overwhelmed by the combined power of Kaiju Waterfront and Gameciel, the Sea Turtle Kaiju! 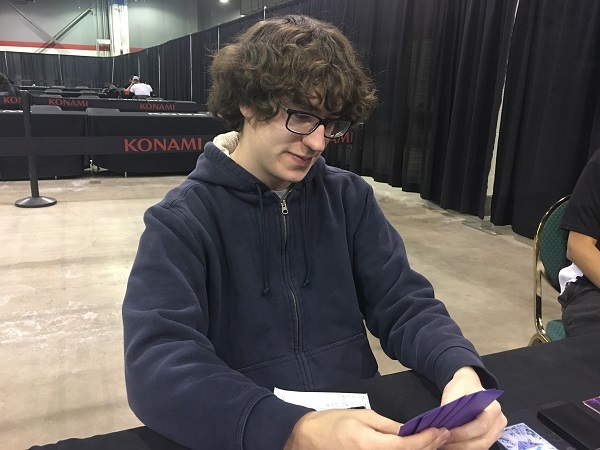 Canada’s Stefan Molgat takes a commanding 2-0 victory in Round 2 with his Crusadia Guardragon Deck! Molgat advances with a 2-0 record!